Cassidy Single Handle Bar/Prep Faucet, Chrome Bar/prep faucets go beyond the kitchen, to butler's pantries, morning kitchens and more. 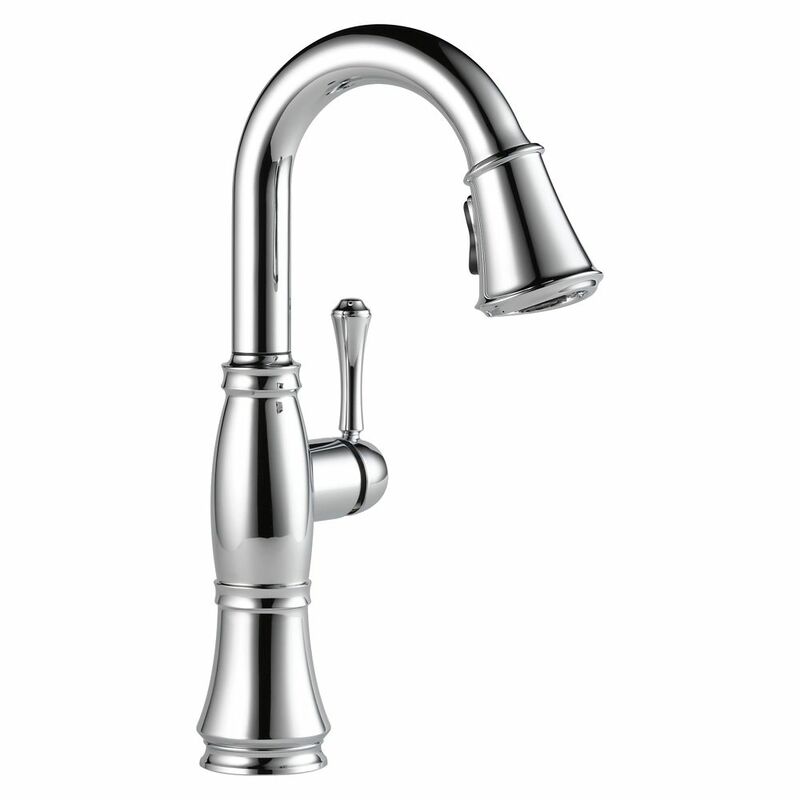 Cassidy Single Handle Bar/Prep Faucet, Chrome is rated 4.8 out of 5 by 22. Rated 5 out of 5 by Libby from Exactly what I wanted So far (only 1 week) I’m pleased with the faucet, especially the pull down spray feature. I have much better control of the water flow. Rated 4 out of 5 by Eagleeye from Cassidy Facuet I bought this faucet about a month ago with reservations due to pricing, when I got it installed I called the Plummer back because the neck turns 360 degree. After that I love the features especially the one that control the bubbles. I bought the oil rubbed bronze and it's pop for my new sink and kitchen make over. Rated 4 out of 5 by HomeDepotCustomer from Beautiful faucet. Controls are smooth and simple to use.... Beautiful faucet. Controls are smooth and simple to use. Pull down part of faucet does not readily return to its original location. Faucet stream seems less than my old Kohler faucet. Rated 4 out of 5 by Particular from Go with the prep sink faucet instead! My initial purchase would have been rated 3 unremarkable st... Go with the prep sink faucet instead! My initial purchase would have been rated 3 unremarkable stars. The sprayer came with a new feature, Spray Shield, which I didn't want and didn't like. Basically, rather than having a 2-function nozzle (stream + spray), Delta engineered a 3-function nozzle. But in doing so, the spray was compromised, broken into a left and right pattern rather than a full circle. The Spray Shield's purpose seems dubious at best - to minimize splatter from the spray - yet it is recommended to hold it so close to the plate that it wouldn't splatter much anyway. The Spray Shield pattern is meant to be a bubble of spraying water enclosing a laser-like stream in the middle, purportedly to dislodge food. If your water pressure is 80-100 psi it might be great, but mine is half that at its best. I phoned Delta's customer care twice. The first guy said to flush the line and it would improve. Nope. The second time I was fortunately able to obtain a 2-function sprayer, the same as came on my prep-sink faucet in the same style. If I was doing it over, I'd just order two prep sink faucets: good spray pattern, enough height for function, and better price. 4 stars because with the new sprayer it works well, as it ought to have out of the box. Rated 5 out of 5 by Lisa from Beautiful for prep sink. Looks perfect in Island sink. Size... Beautiful for prep sink. Looks perfect in Island sink. Size is just right. I bought the full size for my sink. They compliment each other well and the look of my kitchen is elevated. Rated 5 out of 5 by Roadstead from Love the faucet upgrade! It was especially easy to install! Love the style and bold look along with the functionality! Many compliments so far. Works very well with our decor!